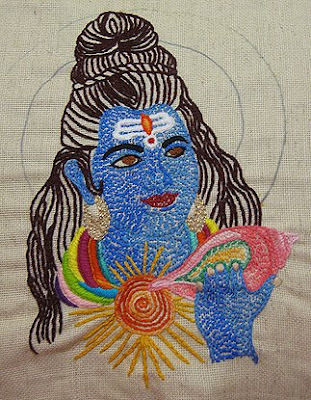 I have been keeping an eye on the progress of this beautiful embroidery that Amanda Panda Pants has been making! Amanda, was this available as an embroidery design, or did you transfer it yourself? Do tell! Oh wow... how long did that take? I pulled a clip art pic off of the internet, traced it, and turned that tracing into a transfer. I am ashamed to say that I'm still not done with this and I started it in January of this year!